Unless you live withing walking distance of a dog park, you will likely need to travel in a car with your pooch to get to your destination. While this may seem like a quick and innocent ride, a lot of pets are injured this way each year. Even a low-speed accident can throw an animal across the car and even though a windshield causing serious injury or worse. A lot of pet owners will purchase carriers or crates that they will use for traveling, but these products can provide a false sense of security in most cases. In the carrier isn’t secured to the vehicle, it can still fly around the interior during a crash, which can also cause harm to the driver and other passengers. A secured carrier that has too much movement room can still be a problem since the dog can still get thrown around inside of the cage. Luckily, there are other options that can be used for pets riding in a vehicle that are actually safe to use. The most recommended of these options is a harness that snugly fits around the body of a dog combined with a special seat belt designed just for this purpose that attaches that harness to the car. The end result is the same protection that you receive, making it both safe and extremely affordable. In fact, this can be accomplished for less than most carriers. 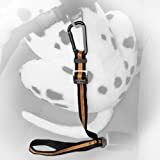 The harnesses that are used for this purpose are the same that you would use with a leash, so this is partially a multi-purpose product that you’ll use on the go with your dog at all times. Technically, you can accomplish the same thing with a neck collar, but the body harness is much safer to use with the special Kurgo Direct to Seatbelt Tether because it distributes the force throughout the body instead of on the fragile neck. Even if you love going to dog parks with your canine friend, there is almost certainly one thing that you do not love – fur all over your car. When a dog sits on a seat, their loose fur will shed and stick to the seats, but then this fur will still attach to people that sit there later. Plainly put, nobody wants to get covered in hair each time they go for a ride. You can drastically reduce the amount of fur that actually does reach the upholstery of your vehicle by using seat covers or hammocks. The hammocks are usually best since they can easily be removed and replaced so they only need to be present when your dog is riding. They provide a comfortable place for your pet to lay down while the vehicle is moving and they’ll keep separation between your vehicle interior and your pet. If you have a large vehicle like a truck or SUV, your pet may have a difficult time climbing up into it and also getting down. In fact, a lot of owners can often be seen simply lifting their dogs in and out to prevent them from getting injured. However, this can really get old, especially if you have a heavy dog. 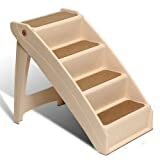 There are simple step stairs made for vehicles that solve this problem for both you and your pet. You can easily travel with it and pull it out at your destination to let them get out safely. Simply repeat the process when you are leaving to let them back in. Larger dogs that begin to age can have difficulty jumping up high and small dogs of any age may simply not be big enough to make the leap, so these steps are excellent for a variety of situations.